As you know I am still settling and enjoying all the beautiful weather in Bangalore and enjoying the process of of buying basic staples and filling in my kitchen pantry. (Thanks to Hypercity, One Shop Stop). With Festivals Rush, Independence Day celebrations the 4 day long weekend (for kids) was hectic and now i can breathe some air while writing about how my mishap of forgetting to buy the cornstarch resulted in new invention of Manchuria with no Corn Starch :-). Yes you heard it right!!! as this has been tested in my kitchen and guests loved it, you can try this fusion recipe with no confusion, even when the main ingredient is missing (corn starch). :-) Here is the recipe for you Enjoy!!! Wash the cauliflower florets in salt water, drain them and microwave for 2 min and set aside. In a medium bowl mix the all purpose flour, turmeric, chopped garlic, soy sauce, salt and black pepper. Add water little by little so that it becomes like batter. Then add the crumbled bread slice to the mixture that makes it little thick. Now add the cauliflower florets and coat them well with the batter. In a Kadai heat the oil for 5 min, and then slowly drop the florets in the oil, and fry them until they become light golden color. Add Soy sauce, Red Chili Powder, Salt, Red Chili Sauce mix it well. Then add Tomato sauce. I like the flavor of little sweet to soften the spices in manchurian sauce, so I have added sugar. If you like it strong and spicy you can skip this. If you have Honey handy you can add 1 tsp honey instead of sugar. Mix in Cilantro to the sauce. Add water to it and give it a quick stir, now add the flour to make it little thick. Taste and adjust the seasonings accordingly. Now add the fried cauliflower florets to the sauce and coat them well with sauce. 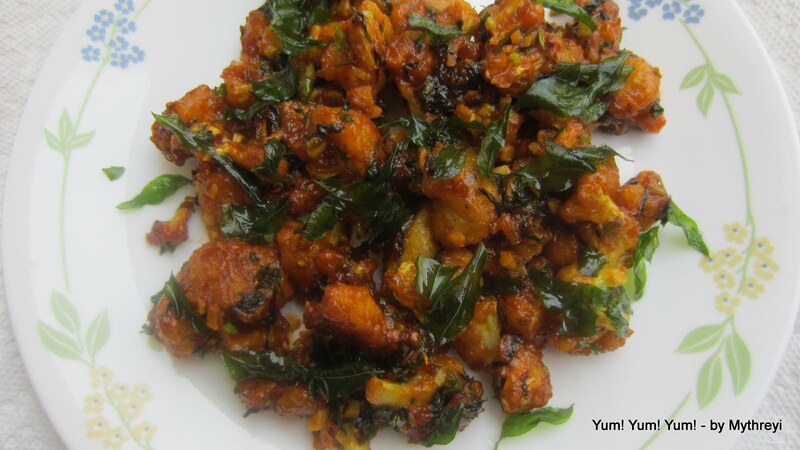 Transfer it into serving plate and garnish with cilantro and fried curry leaves. If you excuse me, I will enjoy my yum yum Gobi Manchuria while it is hot. I have not added any food colors. The beautiful color is from the natural ingredients turmeric powder, red chili powder and soy sauce. 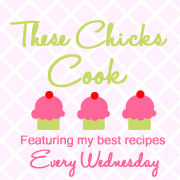 I have linked this to These Chicks Cooked Potluck by Katie. That is a nice idea of adding bread!! and the pic with curry leaves garnish.. This looks so appetizing...I love indo chinese food..nice recipe..thanks for sharing! wow wonderful without corn flour..
Crispy, tempting & deeeliiicious manchurian!! 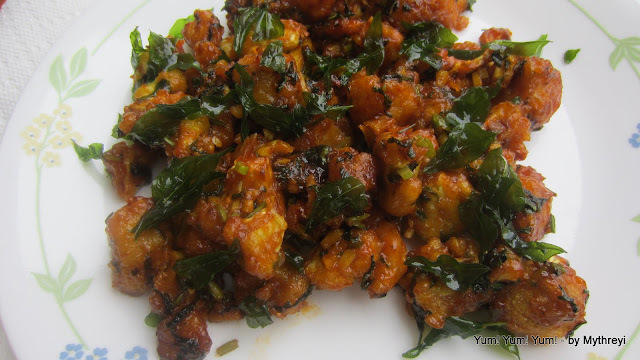 I miss Bangalore a lot at times, all my friends are there :) This manchurian is rocking my dear and I should try this version too! Feel like finishing that whole plate, droolworthy manchurians..
if you had not said it I would not have realised there is no corn flour in the recipe. Looks delicious. I want it all. wow awesome recipe without cornstarch dear...love it!! I am so excited to get this recipe. I am just going to love the cauliflower made this way, and that sauce, oh my, I just can't wait to make this dish. It is Yum,Yum,Yum! Hope you have a great week end and thanks for sharing with Full Plate Thursday! Thanks for the nice recipe Mytheri. I'm a friend of Sowjanya, found your site through her facebook. Finally I was able to make Gobi Machurian at home, which my DH asking for years. It turned out really yum,yum. Loved your blog and the tempting pics and recipes. Waiting for more yum,yum recipes. Yum! Yum! Yum! on Facebook. First time 2 ur space...loved it...Nice idea of adding bread crumbs. Liked ur collection of recipes,presentation etc..